I'm up with the rain and the birds this morning. 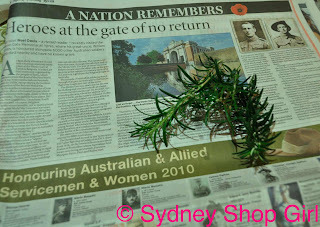 It's ANZAC Day and I've had a quiet moment to reflect on the past and what others so bravely fought for on our behalf. I continue to hope that we never forget. Wars and their suffering continue to this day but maybe, one ANZAC Day, things really will be different. I also remembered all the lovely Diggers I've had the privelege of looking after over the years and I hope that wherever they are, they are in good health and able to participate in today's memorial services. Your country is humbly grateful for your service. Not only to you, the heroes of the past but also to the men and women who continue your efforts in the present.